PLANET in PERIL, your "one-stop shop" for the truth about our planetary crisis. : Palm Oil Was Supposed to Help Save the Planet. Instead It Unleashed a Catastrophe. A decade ago, the U.S. mandated the use of vegetable oil in biofuels, leading to industrial-scale deforestation — and a huge spike in carbon emissions. Story here. 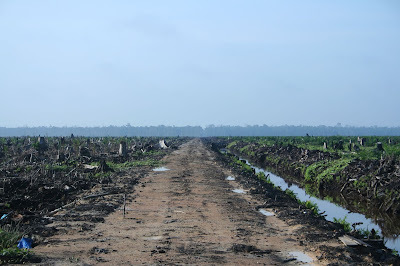 A palm oil concession in Sumatra. Photo by Hayd.